Learn about the benefits of hiring a trade show logistics company. Trade shows and expos are a great way to gain exposure for company brands; however, it takes a significant amount of planning to ensure shipments arrive on time. Trade shows and other special events must adhere to strict schedules. For 27 years, AFP Global Logistics has provided customized logistical solutions tailored to meet the deadlines for numerous trade show, exposition and convention shipments annually. Companies have proven it is beneficial to partner with a trade show logistics company like AFP Global Logistics as a way to guarantee on-time exhibit material delivery or pick up and to avoid unnecessary expenses associated with untimely shipment handling. AFP Expo Logistics, a Division of AFP Global Logistics dedicated to the trade show, expo, and events industries, has earned a no-fail reputation by providing a peace of mind industry professionals have come to rely on for effective and efficient brand expose at these types of venues. Continue reading to learn more about AFP Expo and the benefits of hiring a trade show logistics company. Companies often invest in exhibiting and attending trade shows and expositions as a way to promote their products and services to a targeted group of attendees and create direct sales opportunities. From exhibit-related, promotional, and staffings costs this style of marketing can easily cost twenty-five thousand dollars per venue. 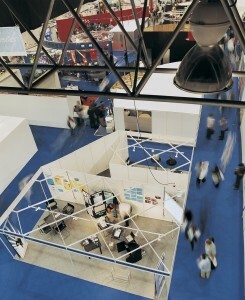 A company may attend several different trade shows and expositions annually. In order for companies to maximize their return on this investment, deliveries must arrive on-time and damage free. Imagine the repercussions if the exhibit material shipment arrives damaged, late, or worse- not at all! The impact on the Return on Investment (ROI) suffers greatly and jeopardizes the reputation of the company brand. On time and damage-free delivery maximizes the time allocated for an efficient set-up of your booth that meets the basic guidelines set by trade show officials. Hiring AFP Expo Logistics is the best way to ensure exhibit booth and materials arrive on time and damage free, allowing companies to successfully market their brands and create a lasting impression on trade show and exposition attendees. As a trusted trade show logistics partner, AFP Expo ensures exhibits arrives on time and damage free for companies shipping from one venue per year to several annually. Each shipment is customized to adhere to the show facts guidelines, bills of lading (BOL) contain the necessary details, shipment progress is monitored from shipment pickup to delivery and proof of delivery (POD) is relayed via email, text or phone call to ensure exhibit materials always arrive on time and damage free. At AFP Expo, we understand in the trade show industry, a few hours can mean the difference between a successful event and a complete failure. That’s why we will always go above and beyond to meet the event requirements and provide exceptional customer service while offering a straightforward and stress-free shipping experience. Exhibiting at trade shows, expositions or events is a costly investment; often, with no allocation for additional expenses. In general, shipment coordination is tricky, time-consuming and one simple mistake could result in additional costs. Exhibitors must beware of additional costs associated with shipments arriving or departing outside the dates and times specified within exhibitor kits or show facts. Storage is charged when exhibit material arrives to advance warehouses off schedule. Direct to show shipping could result in the additional wait time expense for unscheduled move-in and move-outs. AFP Expo eliminates those risks by providing logistical consulting and planning services with one goal in mind- to avoid unforeseen expenses passed onto our customers. As companies invest in various marketing styles, AFP Expo invests in building business partnerships with our customers. Through effective communication, we take the time to understand our clients’ marketing strategy and how attending trade shows, expositions and events impact their road to success. Understanding their business model allows AFP to establish a timeline by targeting specific pickup date and times that align with companies production schedules and show itineraries giving the customers the ability to select a service level that meets their deadlines and budgets. With a full menu of shipping services, from FTL shipping to expedited same day air freight services, AFP customizes our services based on shipment urgency and provides a high level of customers service through continuous shipment monitoring and communication. The AFP Expo team understands the logistics of trade show management, guides customers through the documentation process and acts as a liaison between general services contractors, carriers and exhibitors. While ensuring your materials arrive on time is an integral part of the process, you will also need to think about storage for your materials and booth. If you plan to have your shipment arrive early, you will need a secure place to store items before the trade show begins, as well as after the event is over. Thankfully, a trade show logistics company will take care of this problem for you. AFP Expo offers short and long-term storage in secure warehouse facilities for pre and post-trade show. Our warehouse solution provides a clean, climate-controlled, dry storage space with fully experienced and pre-screened personnel to ensure your items are as safe as possible. This entry was posted on Friday, January 25th, 2019	at 3:26 pm	and is filed under Trade Shows	. You can follow any responses to this entry through the RSS 2.0	feed. Both comments and pings are currently closed.